Gold continues to grow the economy of Rolldovia, and now there are new ways to build your cities for maxinum effect. 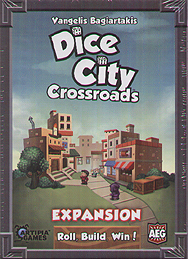 Crossroads features new locations that not only work with the row they are on, but also the column, providing you with exanded opportunities and combos as your inhabitants find new ways to navigate their city. Now there are even more ways to roll, build and win! Expansion only. Base game needed for play.